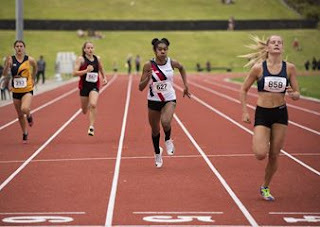 Sixteen year old Letisha Pukaikia continues to impress as she seeks to further her career in athletics whilst attending school in New Plymouth on New Zealand’s North Island. Competing at the New Zealand National Championships in Hastings last weekend Pukaikia won the bronze medal in the Under 18 division in 25.85 seconds, an improvement of three quarters of a second on her best performance last year. She also placed fourth in the 100m sprint. Born in Port Moresby of predominantly East Sepik heritage, Pukaikia’s athletic talent was first spotted by her teacher at Footscray North Primary School in Melbourne which she attended in 2012 and 2013 whilst her family were residents in Australia. Athletics PNG’s jumps Coach Phillip Newton spotted her talent for long jump at a talent ID camp in Port Moresby in December 2013. After two years back in Port Moresby the youngster made the move to New Zealand early in 2016 where she has focused on the sprinting events due to the absence of a specialised jumps coach at her school. Athletics PNG President Tony Green confirmed that Pukaikia has been nominated to represent PNG at the 2017 Commonwealth Youth Games which will be in the Bahamas in July. “Letisha did very well last weekend considering that many of the competitors would have been a year older than her. We hope to be able to get Letisha over to Fiji at the end of June for the Oceania U18 Championships as that will be a very good lead up competition” he added.